Bachelor and Master of Music Haute Ecole de musique de Geneve. Natasha Foresi was born in Russia to a musical family. She began to play the flute at the age of ten and studied with many renowned musicians including Moshe Epstein (Israel), Kathleen Rudolph (Vancouver) Maurice Pruvot and Florence Souchard (Paris) Emmaniel Pahud & Jacques Zoon (Geneva). 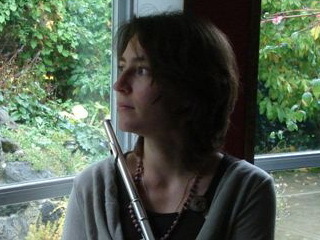 She earned Bachelor and Master degrees in flute performance from the Paris and Geneva Conservatories. Natasha Foresi is a lucky recipient of numerous awards and scholarships: Karen Sharet scholarship, McPherson music society scholarship, British Columbia Fund scholarship just to name a few. After returning from Europe, Natasha Foresi is now an active freelance performer and teacher in Vancouver. After returning to Vancouver, Ms. Foresi runs a successful flute studio in Richmond & Surrey, preparing students for competitions, festivals, RCM exams and University auditions.